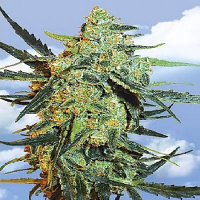 Shark Attack relaxes the body and muscles very noticeably, like hashish, and the effect is strong and pleasurable. 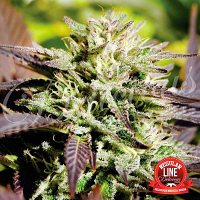 This indica dominant strain is mostly important for 3 reasons: white layer of resin that it produces, its medicinal effect due to its high CBD content and its intense indica aroma and taste. It does not grow very tall; the internodal distance is low with this strain making easy to control the size. Leaves are wide, short and very dark with an indica smell. If you rub the stems there is an intense aroma offering a prelude to the strong sweet & sour aroma that the flowers will produce. It gives medium production, ripening completely after around 55 days. It’s recommended to keep it in total darkness for the last 5 days to stimulate aroma and resin production. 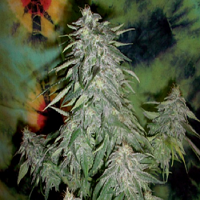 The buds are white with a very pungent smell and, when smoking it, the smoke is dense and pleasant. 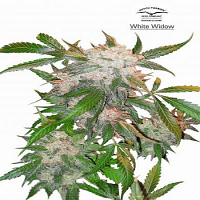 Outdoors it needs a dry climate to avoid mould and it can be harvested until 10th October. However, be sure to check it if it rains, or the climate is humid, for the appearance of mould. 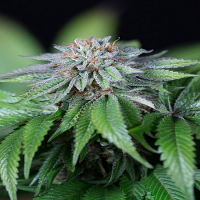 The best medicinal quality is obtained by growing this plant biologically, combined with a good flushing with plenty of water and stimulators before cutting it.